Let’s try this again. I wrote most of these instructions up yesterday and accidentally deleted them. I was so sick, they were so detailed. O-well… Back to the drawing board. I usually do not write a lot of quilting instructions so please let me know if you find any errors or have any questions. I used the small AccuQuilt Go Value Die for this quilt. It works with the AccuQuilt Go Baby but I don't have a Go Baby just yet. 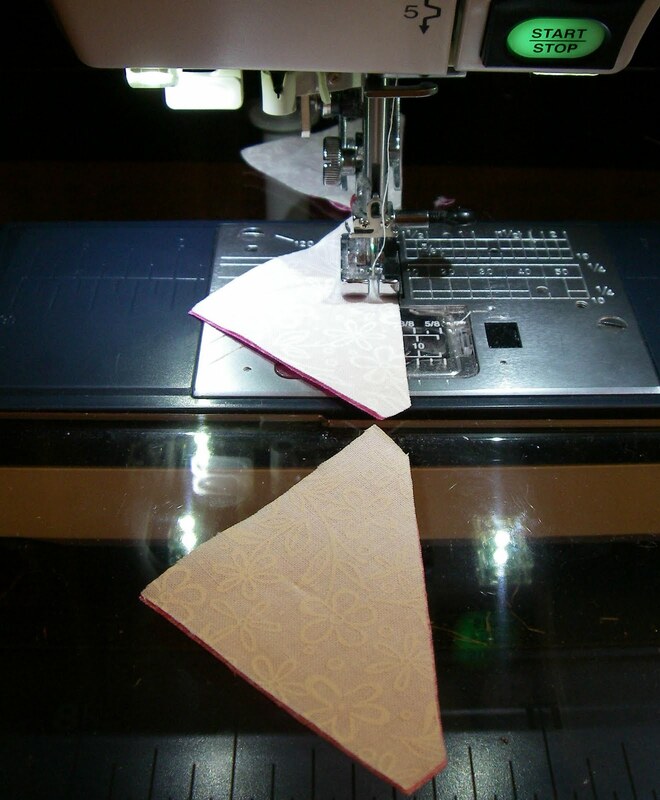 I usually cut a maximum of 4 layers of fabric on my AccuQuilt Go. It just works best for me to help in making sure the cuts stay as accurate as possible. Also, I always line up my fabric edge (you know the one with the manufacturer’s name on it) parallel with the long edge of the die. 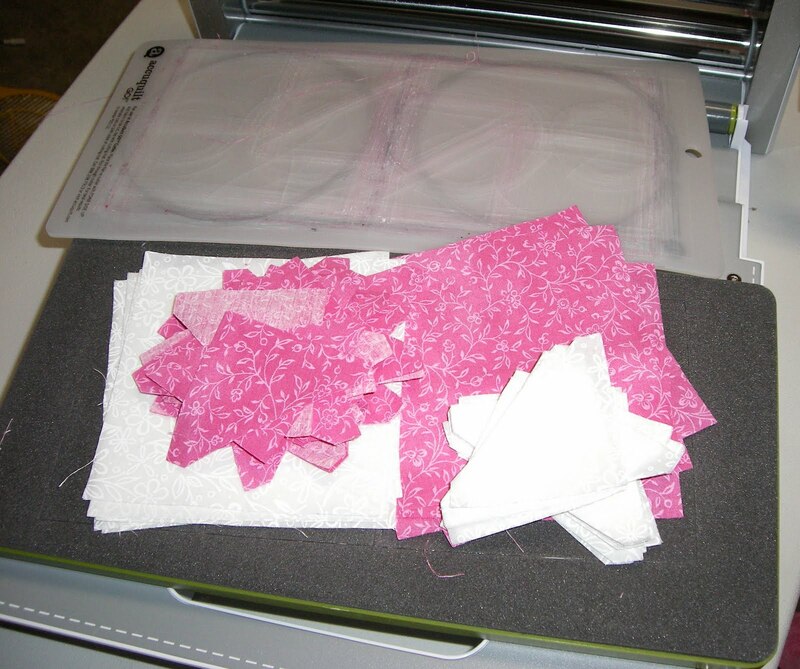 There are also some great tips on the AccuQuilt Go and Yahoo Group. 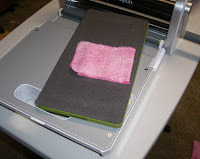 I usually cut or rip my fabric into strips and then I accordion fold it over closely over the one die needed. My strips are just a little bit wider than the item trying to be cut. This allows me to minimize my scraps. And before I know it, I have a whole pile of cut out blocks. First step is to pair up all 240 dark half square triangles with your 240 light half square triangles and sew right sides together. During this time, I feed them one by one into the sewing machine and then snip separate them later. Iron each one open pressing the seam to the dark fabric. Repeat the steps above with the half square triangles for the border . Match one light with one dark and sew right sides together. Iron each one open pressing the seam to the dark fabric. Now, it is all about direction on the blocks. 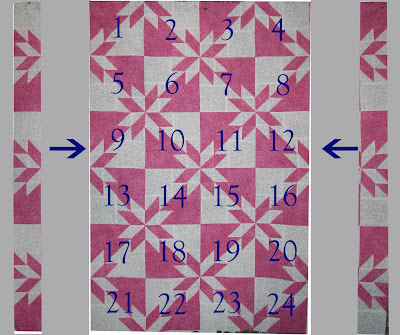 There is really one base block to this quilt that when repeated creates the star. 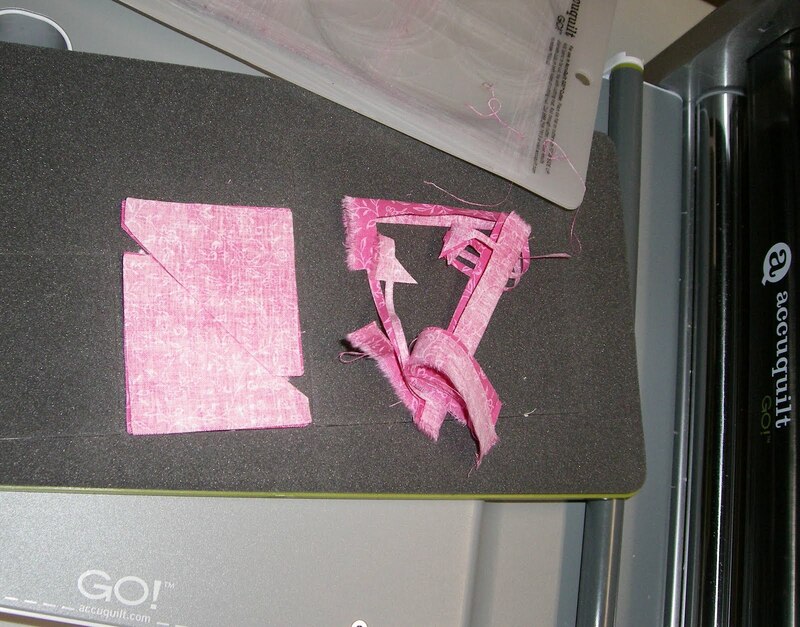 Make 24 full blocks and then we'll make 6 blocks without the final seam. In image1 you can see the direction placements for the half square triangle blocks. We'll start working in the top left section, place 4 of your half square blocks to match the image. 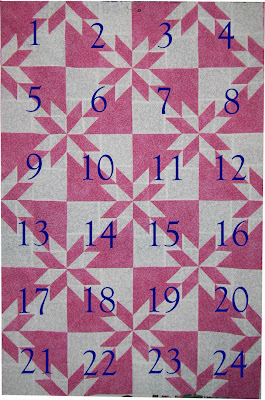 Make sure you keep track of which side needs to be sewn to keep the blocks in the direction originally laid out. Sew TL1 to TR1 to make a row 1 in image2 (below) and then sew TL2 to TR2 to make row 2 in image2 (below). Ignore the 4 1/2 inch blocks for now. 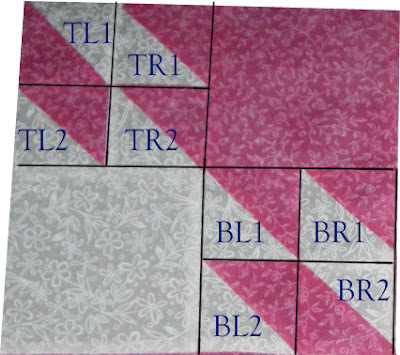 In the bottom right quadrants of Image1, position 4 more half square triangle blocks in the right directions to match and then sew BL1 to BR1 to form row 3 in image2 (below) and then BL2 to BR2 to form row 4 in image 2 (below). Position your rows to match the layout in image2 above. Now sew Row 1 to Row 2 with matching up the center seams. Once completed, the block will match block1 in image3 below. 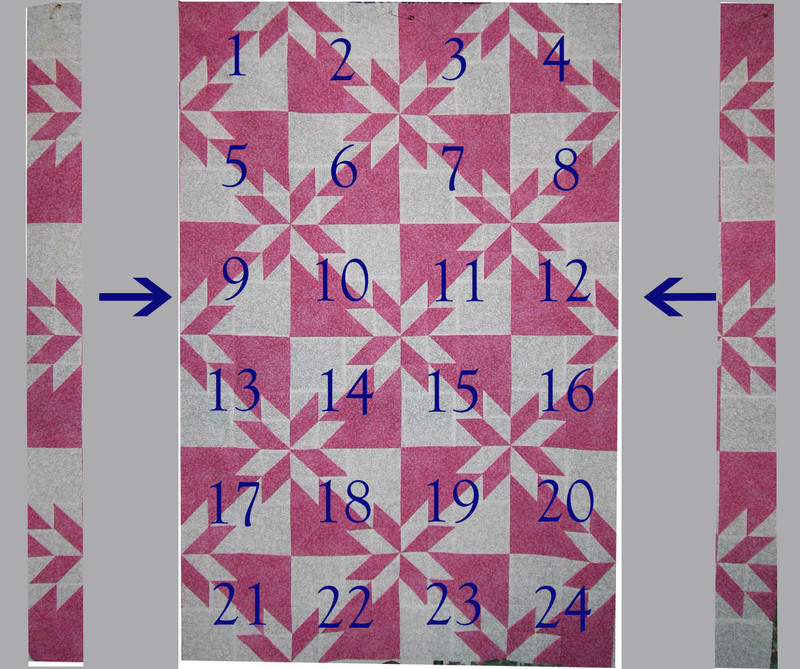 Move on to sew Row 3 to Row 4 to create block2 in image3 below. To finish the block, match the positioning in image3 and sew Block1 to a Dark 4.5” plain block. Then sew a light 4.5” plain block to Block2. Finally, sew the two block top half to the two block bottom half to complete the block as in image4. Repeat this process to create 24 of these individual blocks. There are 3 more blocks to complete. 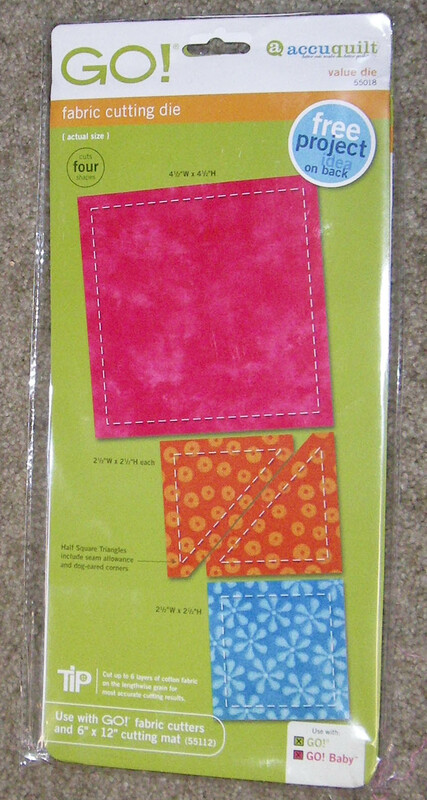 However, on these 3 blocks, do not sew the top half to the bottom half. This will leave 24 completed blocks and 6 halfs. Then assemble each of the 24 full blocks to match image5 below. I usually complete the rows first and then assemble the rows. All you need to do is make sure your blocks match the layout in image4 below. You basically rotate the individual block to match up the “feathers” of each star. Also, I took a lot of time to match up the seams and pinning. 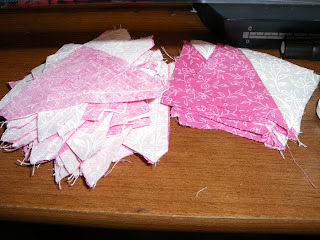 The six half blocks will be going on the right and left sides of the center quilt. Assemble the half blocks to match the layout below in image6. 3 half blocks for each side. 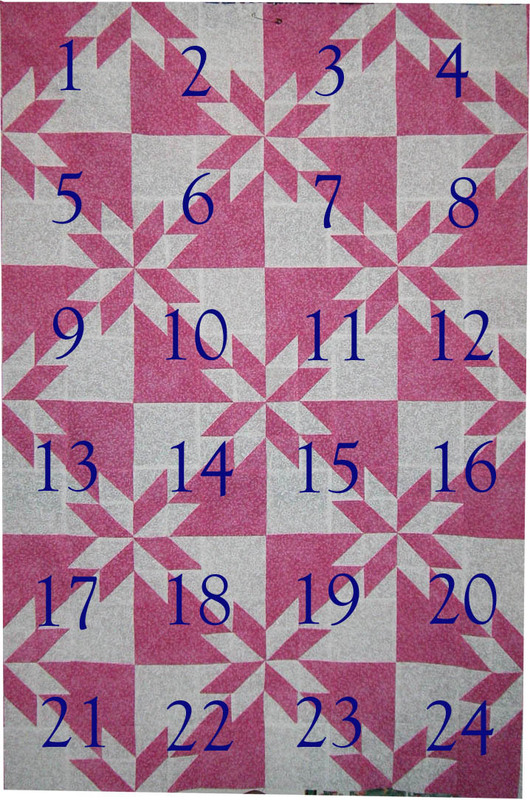 Then attach the two rows to the left and right of the center quilt. Be careful to match up all the different seams. I like to use pins to make sure my seams line up. On to Part II for the borders. This so wonderful! Hunters Star is one of my favorite patterns and I am so glad to know I can cut this out with my GO! Thank you so much for these instructions. I can't wait to get started. Thank you so much for these instructions! I've fallen in love with this and can't wait to get home and make my own. Great job! Trish Thank you for the great detail for the Hunter star quilt. I think I will make mine in Hunter green for my granddaughter Hunter. Thank you so much for all the work it took you to write up this pattern. gosh Trish, talk about detailing a blog! Fabulous tutorial. I don't have a cutter, but learning techniques is always good. Excellent tutorial Trish. Love it. This definitely goes into my list of favorites. And, I will gladly give a shout out on my blog as well as to my list of quilters with Modern Tools (AccuQuilt) that I maintain on my blog. Thanks for sharing. Great job! This is a great tutorial. Thank you. I have always wanted to make this and I had lots of 'bonus half-square triangles' to work with from another project, so I got right to work. I had a difficult time keeping the position of the HSTs in order, and I have never unpicked so many stitches in my life!! But, my efforts were well rewarded when I finished! Thank you. I look forward to doing this version of Hunters' Star. 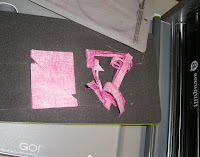 I am using the Studio cutter, so will choose the correct dies from my group of dies. Thanks for instructions and good photos. great instructions - will make this my next project. Great job! Can't wait to try it! Great instructions! You make it look so easy for a complicated looking quilt! Many thanks for all of your hard work! I have a question are you using all three shapes on the die? Or just the top two. I was thing about getting the Hunter star die but it has different shapes on it. Your way looks easy and I already have the die you used. Thank you so much for these instructions! I have been wanting the hunters star die but didn't want to pay that much right now. When I came across your quilt using the value dies I was so excited. Now I can make it without buying more dies. Thank you! Thanks for the great instructions. Bought my material today. Can't wait to start. Thanks for saving me money. I'm excited I dont need to buy another die and can use one I already have. I didn't realize how this block was made. I was wondering what I could make with the value die without having to purchase something else. Thanks for showing me how to make such a great block with those simple shapes! Hunter's Star Progress - Baby or Lap Sized Quilt?